It's most important that you love to have fun and share a drink with friends to be a member of the Morris County Ski Club. This fun-loving group of 250 skiers (ok, there are 5 snowboarders and a few don't even ski) plans great ski trips, activities and social events all year-round. So if you're from North Central New Jersey and looking to add to your social calendar, joining the Morris County Ski Club may be just for you! The Morris County Ski Club - Not just a Ski Club. Just ask Morris County Ski Club member Tom Buhlinger about what his club is all about and he'll tell you "It's more of a way to go out and do a physical activity and then have drinks afterward." This is a very social ski club where you're bound to make a bunch of new friends. Although not all 250 members partake in every activity, everything from hiking excursions to wine tasting events are well-attended. Whether it's ringing the bells for the Salvation Army or collecting kibble for some furry friends, the Morris County Ski club loves to give back to the community. Join the club and lend a helping hand to someone in need. Domestic Ski Trips and Beyond! Every year the Morris County Ski Club plans day ski trips, journeys out west and one fantastic international trip. The big trip for 2008 is Innsbruck, Austria which like many European destinations involves more than just hitting the slopes. Twenty five percent of members going to Austria don't even ski! Coming Soon: Whistler - North America's winter wonderland! Can't wait just one more season to visit Whistler? Check out some great Whistler accommodation deals and discount lift tickets and make the journey yourself. Hey, maybe you'll even make some new friends when you join the Morris County Ski Club and you can bring 'em along! Imagine you're just heading home from your stay at one of the most beautiful hotels in Quebec. Now imagine terrible, icy road conditions that halted you part way. You have to stop and shack up at the Super 8. You'd be pretty bummed. Well, the ski club members on this ill-fated trip knew how to take things in stride (quite literally, they had to form human chains just to walk across the parking lot!). "Everyone was forced to stay together and party in the conference room. We wiped out the Digiornio Pizza. It was the best time I ever had.....in Plattsburg, New York," says member, Tom Buhlinger. Make a New Friend or Two.... or Ten! This club caters mostly to the single adult crowd and those looking to have a great time. Joining this ski club is a sure-fire way to build your social circle fast! The Morris County Ski Club is one the friendliest, nicest groups of people you can meet anywhere. In the words of a member "Join our club and you'll meet your new best friends." She chuckles and adds "you'll meet your new roommate!" 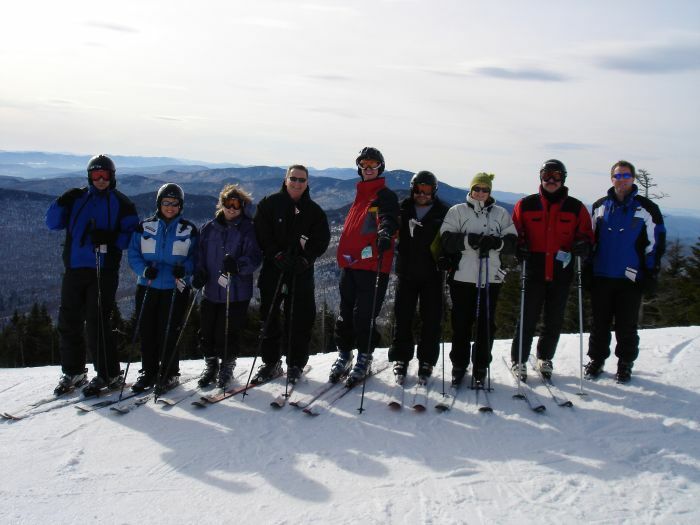 Many relationships and life-long friendships have blossomed between ski club members. Pop in to one of the Morris County Ski Club meetings held at 8pm on the second and fourth Tuesday of each month (second Tuesday only, June - August) to find out more about the club. If you're convinced already, go ahead and fill out a Membership Form and bring along $35 for the application fee. Already a Morris County Ski Club Member? Drop us a line if you are a Morris County Ski Club Member. If you have any additional tips or useful Morris County Ski Club information to add to this page, please email us!